Each trend and 'Breaking News' has its fake news version but usually, as with all things news, they have a short lifespan. The longest of them in recent times was the controversy that trailed President Muhammadu Buhari's secondary school leaving examination certificate, which lasted for about a fortnight. 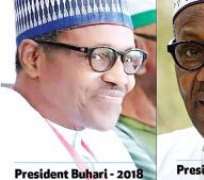 But one 'Breaking News' or 'Fake News' that has refused to go away after many weeks is the story of President Buhari's body double conspiracy theory, one Jibril Aminu from Sudan, which is spreading like wide fire. What started as a gossip shared in hushed whispers has gained so much traction strong enough to elicit official reactions. It was a story that broke on the clandestine medium, Radio Biafra, propagated by its promoter and leader of the Indigenous People of Biafra (IPOB), Nnamdi Kanu, who earlier this month resurfaced in Israel many months after he was missing in action during the military's Operation Python Dance in his home state of Abia. Kanu has consistently asserted that there is an imposter in Aso Rock, Nigeria's seat of power, with threats to expose how Jibril Aminu was transformed to replace 'dead Buhari' in London. He alludes that Jibril resembles Buhari except for a cleft ear, broad nose bridge and teenager fresh hands. He further claimed that the Nigerian diplomat who was murdered in Sudan on May 10, 2018, Habibu Almu, was killed over his alleged involvement in the recruitment of Jibril. The IPOB leader, who promised to shock Nigerians with his revelation of how Jubril was transformed to replace 'dead Buhari', while sympathizing with the family of the deceased, urged the Sudanese police to uncover the killers of Almu. While some Nigerians have helped in amplifying the rumour, using posts and comments to express their belief and disbelief in a 'cloned' Buhari, others have been cropping and magnifying recent pictures of the president in comparison with 2016/2017 images when the president was sick and feeble. At the installation of Peoples Democratic Party's presidential aspirant, Atiku Abubakar, as Turakin Adamawa, he said: “No matter how long we choose to feign ignorance, the news of a stranger running the affairs of Nigeria has gained international attention.”I have in the past few weeks received calls from different world leaders and some concerned global investors who sought for my response over this issue which is currently being talked about in almost every home in the country. Another Senator representing Ondo North, Ajayi Boroffice, on Monday reportedly gave an intellectual bent to the discourse in his piece titled 'Buhari, the imaginative clone and human genetics'. It was not as if Boroffice held a conference anywhere to release his alleged statement. Again, it was a glean from the social media where he said: “Ordinarily, I wouldn't like to involve myself in the nauseating debate about the rumoured cloning of President Buhari and the imaginative Jibril Aminu of Sudan because it is rubbish in the face of scientific realities. Amid the rising suspicion of a Buhari double, peddlers of the Jibril story refer to a particular incident in history. For decades, rumours circulated in Russia that former President Joseph Stalin had a “twin” who replaced him during certain situations. Decades after Stalin's death, the decoy finally decided to talk. Felix Dadaev, a former dancer and juggler, had been ordered to work at the Kremlin as Stalin's body double. Just into his 20s, Dadaev was a great deal younger than Stalin, but make-up and the strain of war meant that he could pass for the 60-year-old. “We had all experienced so much suffering that I looked much older than I was”, Dadaev said. Trained at the personal request of Stalin, Dadaev attended rallies and meetings across the Soviet Union wearing the leader's trademark Red Army cap and heavy overcoat encrusted with medals. He watched movies and speeches of Stalin to perfect the mimicry of his movement and intonation. “By the time my make-up and training were complete, I was like him in every way, except perhaps my ears. They were too small”. In an age before media dominated, he didn't have to mimic perfectly Stalin's vocal inflections, just his look and mannerisms. He pulled it off so well even Stalin's closest comrades couldn't spot the imposter. So can Buhari also be cloned? The Guardian put the question to president of the Nigerian Academy of Science (NAS) Prof. Kalu Mosto Onuoha. “I don't know. I don't believe so. What I do know and what I have read is that many former leaders had several look-alikes, like President Winston Churchill of the United States, even some actors. The double or look-alike is used sometimes to protect the original person,” he said. This is one reason why folks are skeptical and slow to shake off, no matter how far-fetched, the tale that Aso Rock's power brokers organised a Buhari double to continue control over power. Another is the Umaru Musa Yar'Adua saga.Eight years ago, Yar'Adua was pronounced dead after long months of speculations about an illness that led to his being flown, in November 2009, to a Saudi Arabia hospital. It was one of the most vicious and dangerous power intrigues in Nigeria's history, where a small knot of family and close-knit power brokers held the nation to ransom. There were no updates on treatment progress. There was no word on the wild rumours flying around that Yar'Adua was already dead in Saudi Arabia and in February 2010, he was secretly brought back into Nigeria under the cover of darkness. Just like Yar'Adua's case, the nation is on the tenterhooks over a Buhari double story that refuses to fade away. And that is because everything about the president, including his state of health is a classified official secret. Disclaimer: "The views/contents expressed in this article are the sole responsibility of The Rainbow and do not necessarily reflect those of The Nigerian Voice. The Nigerian Voice will not be responsible or liable for any inaccurate or incorrect statements contained in this article."